Greetings! We’re Ann Emery, James Coyle, and Kylie Hutchinson. 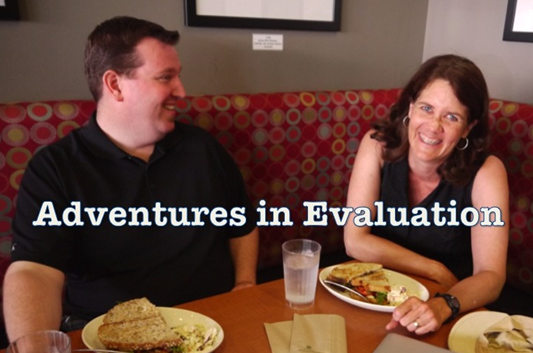 Every few weeks, James and Kylie chat about topics, trends, and tips in the field of program evaluation through the Adventures in Evaluation podcast series. James and Kylie recently invited Ann to join their discussion. We talked about Ann’s aea365 post on 10 Things You Didn’t Learn in School. You can listen to the full podcast here. Lessons Learned: After discussing the evaluation skills that we’d learned on the job, we started discussing the most valuable skills that we gained from graduate school. What a gold standard evaluation should look like. Once you’re working in the trenches, you will quickly find out that many of your intentions for a rigorous evaluation design can get nixed by limited budgets and/or organizational capacity, ethical issues, or a simple lack of feasibility. In these cases, it’s good to at least have a sense of how far the necessary compromises you make are taking you from the gold standard. A solid foundation of evaluation theory, research methods, and statistics. Your graduate experiences are the foundation for the additional trainings that you’ll participate in throughout your career. Your professors also provide invaluable lessons on SPSS, SAS, NVivo, and other programs that you might not use immediately in the field. However, five, ten, or even fifteen years later, you’ll be glad you had this essential training when you’re suddenly faced with re-learning NVivo in a day. Opportunities for strong mentoring relationships with professors and peer-learning with classmates. Your professors (and classmates) can guide you through major decisions about your assignments, projects, and internships. Later on, you’ll encounter plenty of tricky situations in evaluation, and you never know when you’ll need advice again – or when you might be able to return the favor. Evaluation is challenging! Evaluation requires you to make quick decisions and think on your feet. Although three months to conduct an entire evaluation for a course assignment might seem tight, this is not uncommon in the field. How to meet a deadline. Thought all-nighters were a thing of the past? Think again. In many ways the skills you developed to meet an assignment due date in school will help you to also meet those ‘all-too-real-with-worse-professional-consequences’ project deadlines in the working world. Grad school isn’t a 40-hour-per-week commitment, and neither is evaluation. Lessons Learned – What do you think? What are the most valuable skills you learned in school that have transferred to your everyday evaluation practice? Please share your own insights in the “comments” section so we can learn from your experiences.